SERP trackers are off the charts. Is this an extension of previous volatility or something new? Looks like just Google Testing stuff. Published: Jan 10, 2016. 16:26 +0100. This weekend, all the SERP trackers are off the charts. Very significant changes are still happening, and chatter in the community about the fluctuations are at an all time high. The last few weeks have been wild, and if you look at the big picture, the volatility has been present since November 19th. We got an indication that the fluctuations during December were an extension of the November 19th Update, but it seems things have just got much worse. 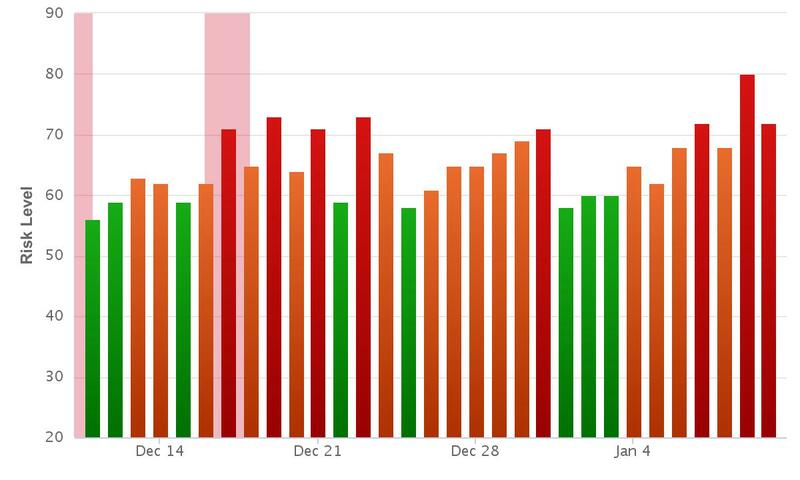 We know that Google Penguin is imminent, and there was a false alarm raised about this on the 6th January when the SERP volatility first started. @rogala_pro @methode We make changes in our algorithms all the time, we have lots of smart people who like to work hard & improve things. We think that the essential part of the conversation is when John Mueller said “ _w/o specifics (“generic query X; results much worse now”) there’s not much to say. Things always change :) _“. This clearly indicates that the testing Google has been doing has not been the most successful. We would suggest that you do not worry about the Google Algorithm changes at present. We think that until the volatility settles down, nothing is set in stone. John Mueller, who clearly has some influence, is not happy with the results of these tests, and as such we suspect some elements of the update will be rolled back in due course. @cognitiveSEO @BrianHarnish @methode I didn't say that. Clearly, Gary Illyes suspects this is not Google Penguin, but that being said, he doesn’t seem to be in the loop just yet on what is going on. This shows just how volatile December 2015 and the beginning of January 2016 has been. It is interesting that the biggest spike over the last 30 days took place on the 9th January. Rank Ranger Risk Index. © Rank Ranger. MozCast shows the biggest spike on the 8th January, with considerable movement commencing on the 4th January. After the previous reports of a possible Penguin update on the 6th January, they did post a tweet indicating that the data was wrong. However, they seem to have fallen silent on that point and kept the data as-is. Perhaps, the nature of the movement (are there multiple data sets \ algorithms being tested?) caused them to doubt the validity of the data initially. Algaroo shows a massive spike on the 10th January, with first signs of significant movement on the 9th. Algoroo SERP Volatility. © Algaroo. What are webmasters saying about the Update? The most in-depth discussions are at Webmasterworld. In particular, there are several references to Penguin Algorithm, and that they do not believe it is related. I’m not seeing anything positive on my 80 ish percent Penguin released website. In fact I’m not seeing any changes at all in my UK niche. Is it still going on? I am seeing a large increase in traffic on a squeaky clean USA website that has been around for a couple years. There are three links the website acquired throughout this time, and Google traffic changes to it is a good indicator of non-penguin updates for me. The industry the website is in is also clean with no spammers I know of in it. If what Google is doing is penguin, I would not expect any of the sites in this industry to move. I agree — this is not (only) Penguin, but imho a refresh or update of the core algo. This doesn’t feel like a Penguin-only update. We never saw a drop of 25% during a Penguin update (we’re seeing a 25% increase). On the other hand, we could have moved up because of new penalties — but the increase seems too big for that.. Fairly new sites should be seeing a boost here, as I’m seeing another round of deindexing of a lot of the older PBN (paid) links some of my niche sites have. This effect would drop older sites down who owned the PBN links, while it misses newer sites who’s PBN links are newer and not on any Google hit list yet. I agree. I just lost a mini network (less than 20) and a website or two on some networks so I guess it’s a rollout of a deindexing campaign. We are not sure what to say about this, except, we advise to focus on White Hat SEO techniques. Unfortunately, while the chatter in the community indicates it is not Penguin, John Mueller is giving some cryptic clues that perhaps it might be, but they won’t confirm either way. Gary Illyes, says that he believes it is not Penguin, but that he doesn’t know for sure. We suspect that they are testing multiple things and that any coherent summary of the changes will be virtually impossible until the volatility settles down. The changes they are testing is certainly not limited to algorithm changes. We have seen rich snippet rating stars change color from yellow, to blue and even gray intermittently. Are your rankings changing? Have you previously suffered from Penguin? Please let us know. Update 12th January 2016 — Google has now confirmed that the update is not Penguin related.